SAP SE announced that it has signed a Memorandum of Understanding (MoU) to launch the SAP Skills University Singapore. The signing was witnessed by Minister for Education Ong Ye Kung. 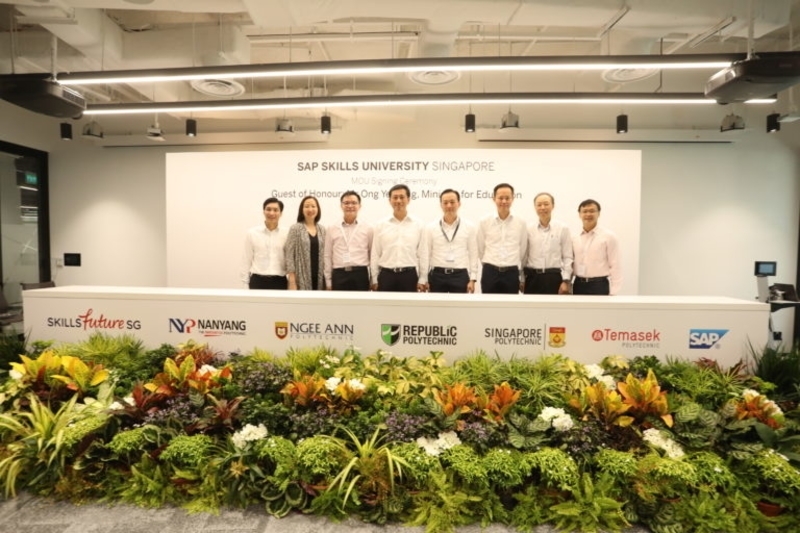 The collaboration was inked by SAP SE, the five polytechnics – Nanyang Polytechnic, Ngee Ann Polytechnic, Republic Polytechnic, Singapore Polytechnic and Temasek Polytechnic – and SkillsFuture Singapore (SSG). Spearheaded by the company, the SAP Skills University Singapore, this is its first such collaboration in South East Asia, and the polytechnics will work closely with the company to develop and deliver the training programmes. The university’s curriculum will be designed in accordance with specific industry demands and skills needs required by technology organisations and their partners. It will train Singaporeans to take on Information and Communications Technology (ICT) related job roles and anticipate future skills demand to build up a pool of skilled Singaporeans who can easily transit into these roles when they become available. The prospectus is targeted at meeting the manpower and skills needs of not only the technology organisation but also the broader industry, including the company’s customers and partners. The collaboration will also offer career advisory and placements services ICT related jobs, with funding support from SSG. As part of the collaboration, two new work-learn programmes which combine placement and training will be made available. Targeted at mid-career individuals, the professional conversion programmes aim to help these individuals gain new skills and transit into the ICT sector. There will also be a programme that caters to fresh polytechnic graduates and facilitates employment opportunities with companies in the Information and Communications Technology industry. Within the next three years, over 1,000 individuals are expected to benefit from the collaboration, where they will be equipped to gain more critical skillsets in emerging technologies such as Artificial Intelligence (AI), Data Analytics, and the Internet of Things. According to the Ministry of Communications and Information, there is demand for over 42,000 workers specialising in data science, Artificial Intelligence, and robotic engineering by 2020. Mr Ng Cher Pong, Chief Executive, SkillsFuture Singapore stated that SSG actively seeks out collaborations with industry partners to enable Singaporeans to keep pace with the evolving skills needs in areas such as data science, robotics, and AI, in order to support industry transformation. This is done as technological disruptions are occurring at an unprecedented pace. He added that SSG is glad to work with the company and the polytechnics to set up the SAP Skills University Singapore. Commenting on the collaboration, Mr Khor Chern Chuen, Managing Director, SAP Singapore stated that equipping the workforce with the right skillsets is critical for any organization or economy to be future-ready and keep up with today’s rapidly evolving world of digital disruption. Mr Khor also said that with the SAP Skills University Singapore, the aim is to facilitate education in the fields of advanced technology and complement the foundation that’s being taught in academic institutions with hands-on learning through the company’s products and working experiences. He added that the partnership is a crucial measure in closing the gap between the demand and supply for qualified Information and Communications Technology professionals. With a workforce of 3,700 across Southeast Asia (SEA) and thousands more in the company ecosystem of over 700 partners, SAP will be drawing from its expertise, knowledge, and network to provide course participants with the training to upskill and boost their chances of securing the role of their choice. Through a long-standing University Alliance programme, the tech innovation giant currently partners over 100 Institutes of Higher Learning in SEA to execute training programmes, in which an estimated 12,000 youths pick up the company’s software development and management skills annually.